Does the holiday season bring a sense of excitement with all of its family and homeschool Christmas activities? Or does it make your head spin with all the amazing possibilities for homeschooling piled on top of holiday festivities, food, and fun? The holidays can be a double-edge sword for homeschoolers. One of the benefits of homeschooling is the freedom to schedule our days how we please or not please. We can sip hot cocoa and read, decorate the house, and take time for special family celebrations. However, in the back of our minds we’re wondering: Should we focus on our history? How many science labs can I squeeze in this month? Is now a good time to start a research paper? Will we finish the math book before the ball drops on New Year’s Eve? Perhaps you’re like me and you’re homeschooling tweens and teens, and the regular holiday homeschool magic just isn’t going to fly this season. 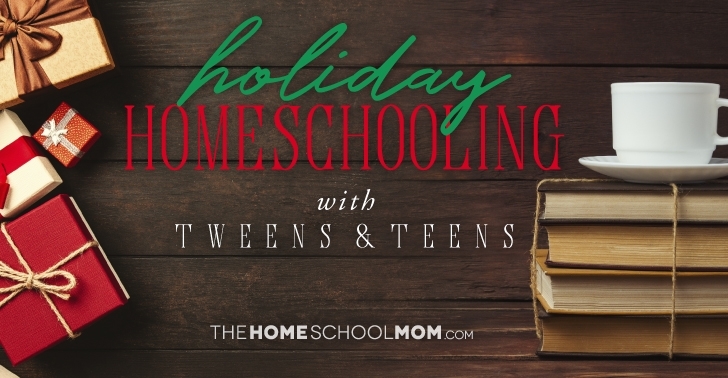 Perhaps you’re juggling outside classes, sports, jobs and the daily hubbub of homeschooling and keeping your people fed, and you are overwhelmed by the idea of homeschool Christmas activities. Let’s ease into the holiday season with a bit of routine, a dash of enchantment, and a big box to pack up things we don’t need until January. Before the busyness of the season ramps up and leaves you in the dust, make a list of all the classes, projects, and activities that are non-negotiable. Get them on your calendar, your planner, or your phone. This will help you get a sense of where you can sprinkle in the fun and where you will need to plan for downtime and rest. We can all agree that overbooking ourselves with homeschool Christmas activities during the holiday season makes for a cranky mom, a cranky family, and no desire to celebrate anything. No need to throw all routine out the window. Your kids will appreciate the consistency and rhythm. If possible, write up the activities on a large calendar where everyone can see it. I often have my kids write up our to-do list. It helps them feel a part of the decision-making process and helps them know what we’re doing and when. When we keep a bit of rhythm to our holiday homeschooling days, it gives us space to really enjoy all the special activities that we’ve planned and leaves room for spontaneous fun. With older kids, the usual festive fun holiday/Christmas homeschooling activities might not be appealing anymore. Yes, I know you wish your kids would still make popsicle stick snowmen, clay dreidels, or pipe cleaner trees. They may or may not want to watch the same holiday movies or read the same books as they did in their younger years. It’s all good! Bring them into the planning process. Ask them what would be fun to do to get into the holiday spirit. Let them plan a few homeschool Christmas activities while you sit back and drink an extra-large hot cocoa. Perhaps some new family traditions will emerge. Host an ugly Christmas/holiday sweater party for teens. Play old-school holiday music, serve cookies and award prizes for the ugliest sweater! Build your own Christmas tree, menorah, or winter solstice wreath or yule log. Have a holiday movie marathon and a hot cocoa bar. Set up a station with hot cocoa and a variety of toppings, such as whipped cream, candy canes, marshmallows, sprinkles and dunking cookies. Queue up the movies and snuggle in for a night of fun. Cook! Your older kids can research and plan and shop for a holiday meal. Don’t worry about turning it into a homeschool lesson (I’m talking to myself). Gather a group of teens for a community service project. Serve at a soup kitchen. Collect donations for a local food pantry. Sponsor local families in need of gifts/food/assistance. Read holiday classics such as The Gift of the Magi, A Christmas Carol, The Return of the Light: Twelve Tales from Around the World for Winter Solstice or The Trees of the Dancing Goats. Plan an EPIC game day! Pull out all those games—board games, card games, gaming systems! Invite friends over and make a day out of it. Attend a local holiday parade or visit one in a new town . Make it a mini-road trip! Create, build or make holiday presents for family, friends, and neighbors. Check out this blog post for ideas. Hold a holiday gift market at your local library or community center. Kids can make products such as baked goods, jewelry, soaps, Lego creations, and more. Entrepreneurship! Research how countries around the world celebrate the main winter holidays. Make authentic food, listen to music, find YouTube videos or create a project using notebooking pages. Hold a winter or holiday poetry tea time. Better yet–have your kids plan it. Here are some ideas to get you started. Celebrate the winter solstice with handmade candles. Create a month long holiday countdown with fun and simple activities. Need some inspiration? My friend has some fantastic ideas to share. What can you put aside until the new year? If you’re like me, a true Type B homeschooler, the answer is probably most things. You have my permission to box up the American history, the chemistry, the grammar guides and whatever else you can. I will admit that we keep up with our math until we take our winter break, but I try to keep the lessons short (this goes back to the routine idea above). When we plan for breaks and we plan for seasonal celebrations, we can sit back and enjoy instead of stress about all the things we should be doing. I physically put away all the day-to-day homeschooling books, projects, and supplies we don’t need. By doing this, it removes clutter and signals to my brain that we are in holiday homeschooling mode. For me–out of site, out of mind. I bring everything back out after the holiday decorations are put away and I can reset our intentions and our space to be fresh for the new year ahead. Let’s embrace the flexibility that homeschooling allows. Let’s honor the season we’re in—both the holiday season and a season with tweens and teens. Let’s plan a little, lean into our routine, and be open to the magic, the wonder and the spirit of the season.